This is one of the greatest of Biblical passages. Momentous and yet delicate. Transcending all human capacity and yet with deep human touches. It is a straightforward account and yet there are many truths in the folds of this short narrative. 11 But Mary stood weeping outside the tomb. As she wept, she bent over to look into the tomb; 12and she saw two angels in white, sitting where the body of Jesus had been lying, one at the head and the other at the feet. 13They said to her, ‘Woman, why are you weeping?’ She said to them, ‘They have taken away my Lord, and I do not know where they have laid him.’ 14When she had said this, she turned round and saw Jesus standing there, but she did not know that it was Jesus. 15Jesus said to her, ‘Woman, why are you weeping? For whom are you looking?’ Supposing him to be the gardener, she said to him, ‘Sir, if you have carried him away, tell me where you have laid him, and I will take him away.’ 16Jesus said to her, ‘Mary!’ She turned and said to him in Hebrew, ‘Rabbouni!’ (which means Teacher). 17Jesus said to her, ‘Do not hold on to me, because I have not yet ascended to the Father. 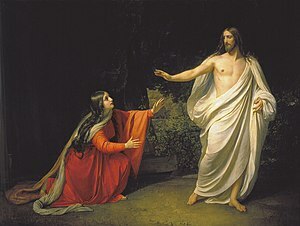 But go to my brothers and say to them, “I am ascending to my Father and your Father, to my God and your God.” ’ 18Mary Magdalene went and announced to the disciples, ‘I have seen the Lord’; and she told them that he had said these things to her. This is John’s gospel and John does not use words just to tell you that it is dark before sunrise. Poor Mary. No one likes to have to explain their tears. It makes it worse to say why. And yet she was asked twice. Why did Jesus put her through the added agony of that question? It was hearing her own name that convinced and converted Mary. What is the lesson of that? Suddenly the language is portentous and formal. The spell of the intimate meeting and actual recognition is broken. Something grand is happening. A new word is being spoken. A new gospel announced. We are not taken to the meeting with the disciples. But can you imagine it?